Her big moment was here. 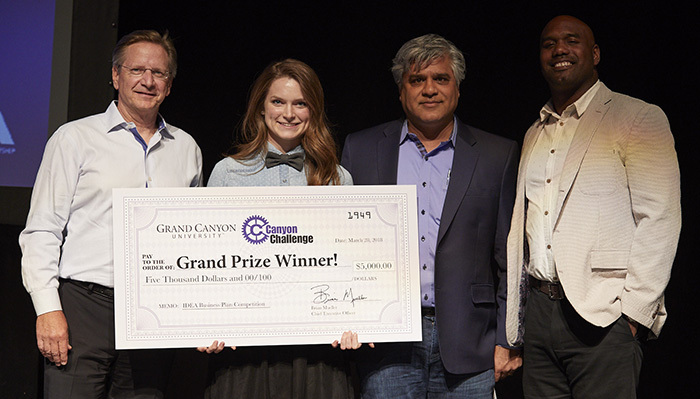 Andrea Northup was the first presenter Wednesday afternoon in the seventh annual Canyon Challenge, and she couldn’t wait to share the story of her startup, Elroi & Men. 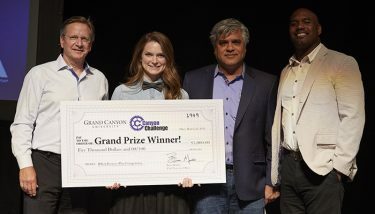 Andrea Northup, wearing one of her company’s bowties, displays her first-place check. With her are judges Michael Hool (left), Ketan Patel (second from right) and Oye Waddell. “I feel like that was the worst I’ve ever pitched in my life,” she said. But here’s the thing about this Grand Canyon University alumna who splits her time between her company and her Sponsor Relations Coordinator role at Habitat for Humanity-Central Arizona: She’s quick on her feet and passionate about her cause – using her bowtie business to help the Lakota American Indians in South Dakota break their cycle of poverty (detailed in this GCU Today story). 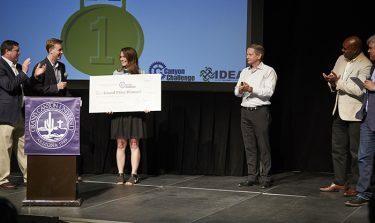 So she found her way through her five-minute talk, and the judges were so impressed that – despite four other strong ideas and presentations by GCU students – they declared her the unanimous winner of the $5,000 first-place check in the entrepreneurial competition. 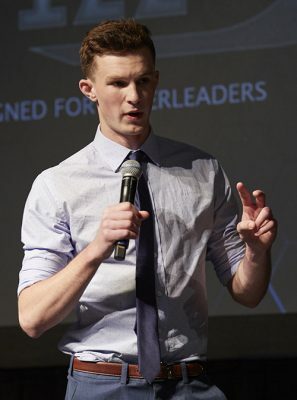 CheerFizz, the energy drink for cheer teams conceived and marketed by freshman Austin Diering, finished second, earning $3,000, and senior Jedidiah Woods’ Thoreson Watches, which aims to provide tutoring for refugee children, was third and got $2,000. The CheerFizz presentation included a cheerleading demonstration. 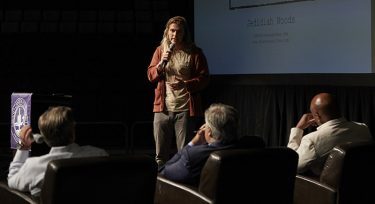 What was most notable about this year’s event was the involvement of students from the College of Science, Engineering and Technology, who had key roles in the two other finalists, Prophet Insight and Lux Longboard Rentals. 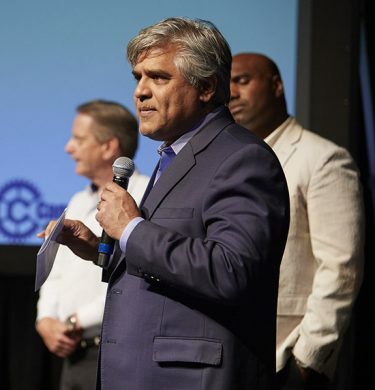 “That’s exactly the kind of student we want to include more in the future – students across all colleges, especially technology and engineering, involved with IDEA Club and starting businesses because they’re solving problems,” said Dr. Randy Gibb, Dean of the Colangelo College of Business (CCOB). The other finalists had a tough act to follow despite Northup’s disappointment with her performance. One of her philosophies is that you have to be “human with life,” and she certainly felt human when she got on stage. “I started off a little rough just because of, I think, nerves and anxiously waiting for something for so long,” she said. “I just praise the Lord for being able to bring that focus back in. Austin Diering, just a freshman, finished second for CheerFizz. Ketan Patel, one of the judges along with Oye Waddell and Michael Hool, said they did a straw poll when they started their deliberations, and all three chose Northup. In a way, her nervousness actually helped her. “Perfectionists always feel they did worse than they did,” he said. “What I liked is that she went off script. That improv approach, I think, lends to credibility. She just listened to every question and answered it directly. Cassandra Jarles, Habitat for Humanity’s Director of Sponsor Relations, saw the same traits in Northup when she hired her last year. She looked as proud as a parent afterward. “When she goes out and talks to faith communities, I have every confidence that she’s speaking eloquently about the program,” Jarles said. “Her compassion for people is I think what drives her to be so successful and be so successful in our organization. Third-place finisher Jedidiah Woods pitches his company, Thoreson Watches. Northup’s victory also felt like a win for Eduardo Borquez, manager of GCU’s New Business Development Center. He has been one of her many CCOB mentors. Northup is grateful for the help, and not just because of what it has done for her business. This is standard practice in CCOB, but it did not go unnoticed as she started to get some traction. Ketan Patel announces the winners. But she’s equally appreciative that her Habitat for Humanity job allows her the flexibility to come to campus when she needs to deal with Elroi & Men issues. “So much. Originally, when you think of helping communities, you think, ‘Oh yeah! We’re going to do this, it’s going to be great and we’re going to succeed!’ But if a potential company that wants to collaborate with you doesn’t like how you’re setting your prices, how are you going to work through conflict? A lot of times, when we reach conflict we want to back away from it – we don’t want to work through it. So what’s next for Elroi & Men? Well, Northup first needs to figure out where she can display that oversized Canyon Challenge check at her desk in the Habitat for Humanity office (“Maybe if I move over my beta fish”), but one thing’s for sure: The money is going straight into her business, mainly for materials to make more bowties. Andrea Northup earned $5,000 for winning. She has the day off Friday and actually was thinking about sleeping in and watching a movie. But she knows better – she’ll probably spend at least part of the day sewing bowties. And she no doubt will spend at least a few minutes reflecting on what just happened. In business, as in baseball, you’re not going to pitch well every time. But a higher purpose like Elroi & Men is like having a good fastball – it can make all the difference when you don’t have your best stuff.